Madai Webb is a Client Associate at Rubicon Advisors. In her role as a client associate, Madai is a person who is able to “get things done” for our valued clients. 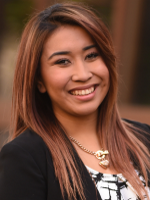 Madai will often be your first point of contact when calling our Redding office. She performs most clerical functions related to opening client accounts, maintenance of client accounts and records along with a wide variety of administrative support duties. Madai served in the United States military before joining the team at Rubicon. Madai was born and raised in southern California. She now resides in Palo Cedro with her husband Nick and their dog Rocky. In her free time, she loves to be outdoors hiking, exploring the North State with her husband and their dog. She enjoys traveling to the warm beaches of Mexico with her family, as well as having bbqs and spending quality time with family and friends.